The computer and textile industries, to most people, seem to have nothing in common. If anything, people can easily comprehend that development in the computer industry led to advancement in the textile industry. How hard would it be to believe that the exact opposite is also correct? Yes, it is quite true that the weaving and textile industry greatly influenced the development of modern technology. How is this possible? The answers can be found in analyzing how exactly a Jacquard loom works. In “Punch Cards: 19th Century Coverlet Technology,” we discussed the mechanics of the Jacquard loom. The basic concept is this: each hook in the loom attempts to push the warp to the opposite side of the weft; this is either permitted or prevented depending on the punch card. The warp is pushed when that location corresponds to a hole in the punch card. Essentially, the punch card holds a pre-set pattern that is read by the loom and serves to guide the loom. The idea of there being recorded information read by a machine was quickly borrowed to be applied to mathematical computation, when Charles Babbage (mathematician, engineer, inventor) attempted to build a calculating machine. His first attempt failed in 1832, when the British government ended all funding for the building of the “Difference Engine.” The Difference Engine was supposed to be able to make calculations based off of a table of numbers. After ten years of building and no further funding, Babbage’s invention was never finished. 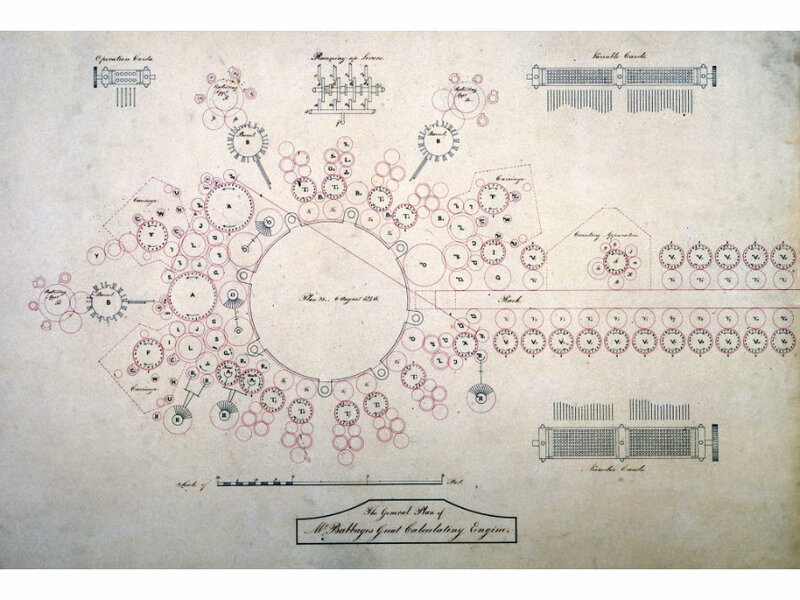 The Analytical Engine was supposed to have two main parts: the store (which holds numbers), and the mill (which used the numbers to compute new results). This notion can easily be compared to the modern-day computer, since in both the Analytical Engine and the modern computer, there are two main parts: one can store data/memory, and the other can compute/interpret this memory. The concept of the Analytical Engine was a great improvement upon that of the Difference Engine. The British government, however, refused to see this, since they were still displeased that they provided 10 years of funding to Babbage’s unfruitful attempt to build his first invention. They denied him the funding that he required, and he attempted to build this machine himself, until he died in 1871 with two incomplete inventions. It is unfortunate that Babbage was unable to see his inventions through; his ideas were so far ahead of his time that the technology with which he was working was not advanced enough to be used in any of his inventions, leaving him to develop many of the pieces of machinery himself. It was not until about ten years later that such an idea was actually created. Herman Hollerith was hired as a U.S. Census worker in 1881, and saw many of the difficulties in tabulating the data. The U.S. population had increased by approx. 30% in the previous ten years, making the calculation much longer and tedious than in the past; in fact, it took the U.S. Census Bureau over 7 years to calculate the data from 1880. Hollerith began to develop a machine that would make such calculations easier, so that any increase in the U.S. population would not pose such issues as seen in the 1880’s. 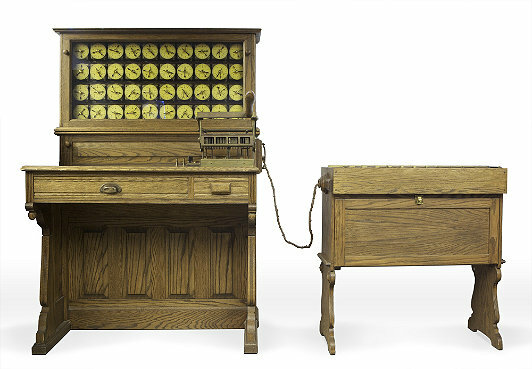 Hollerith created the Hollerith Desk, a machine using a gear-driven mechanism that could count by sensing holes within the punch cards that were entered into the machine. Behind the machine was a wall of indicators (similar to a car’s speedometer) that displayed the results of the collected data. Advances in the technology of IBM’s tabulating machines led to the development of the early computer, which all used punch cards (similarly to IBM’s tabulating machines) and a magnetic memory drum. Such advances included the key punch machine (similar to a typewriter) that entered the data onto the punch card. 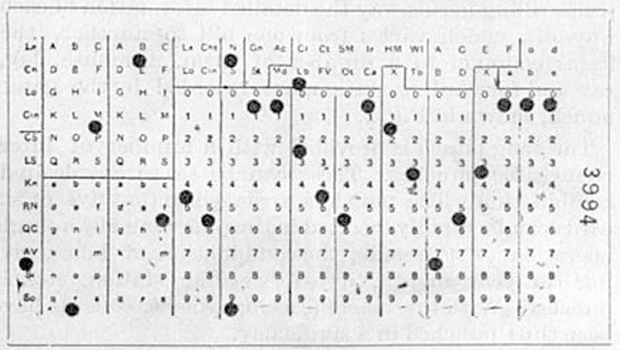 The punch card was the primary method by which IBM stored data until the 1970’s when scientists had discovered other means by which to store data. The develop and widespread use of magnetic tape greatly decreased the need for punch cards, since magnetic tape is much more cost and space efficient. Some punch card machines are still used today: tollbooths, voting machines, etc. This amazing transition of machinery illustrates the importance of punch card technology to the modern world. The invention that has prevailed over two centuries “was not invented by IBM in 1928. Nor was it invented by Herman Hollerith in the late 19th century.” Charles Babbage also utilized, but did not create the punch card. The foundation of all the ensuing technology was Jacquard’s loom created in 1801 which revolutionized the textile industry and created, what is more or less, the equivalent of 18th century graphic design. I am trying to locate a Jacquard loom within about a 100 miles of the Washington D.C area. Do you know of any I could see? Hi David, I apologize for taking so long to respond. There are only two authentic Jacquard looms in America right now. One is located in Michigan. I do not believe there are any within 100 miles of D.C. Some muesums, however, do have remakes that you might be able to check out in person. Thanks for reading!